Just like you wouldn't use just any face wash or foundation shade, you shouldn't use just any hairspray. Here are some questions to ask yourself next time you find yourself in the hair product aisle at the drugstore! 1. How strong does this hairspray need to be? If you just want to smooth out your locks post blow dry, a light hold spray will do just fine. But if you're going for a wavy look (or if you have really thick hair), you'll be better of with a medium hold spray. For uber complicated styles that you need to hold for a while (i.e. your prom updo), you'll probably want to go for the strong stuff. 2. What are your hair woes? 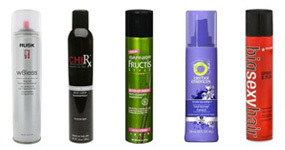 If you want sleeker, shinier hair make sure you pick a formula that promises to gloss things up. Is your hair fried from regular use of heat styling tools? Go for a formula that contains thermal protection. If you're more of a get up, throw something on, and run out the door kind of gal, you'll want a non-sticky option to spritz on and run your fingers through in the morning (might contain words like "touchable"). 3. Do I need aerosol or non aerosol? If you like the "wet" look, go with a non aerosol. Otherwise, select aerosol for easy use and better coverage.